Marsh, James H.. "St. Lawrence River". The Canadian Encyclopedia, 24 January 2018, Historica Canada. https://www.thecanadianencyclopedia.ca/en/article/st-lawrence-river. Accessed 25 April 2019. St. Lawrence River, grand river and estuary, which together with the Great Lakes forms a hydrographic system that penetrates 3,058 km into North America. On the St Lawrence River (Corel Professional Photos). Ile d'Orléans is the largest island in the St Lawrence River after the island of Montréal (photo by Sherman Hines/Masterfile). St. Lawrence River, grand river and estuary, which together with the Great Lakes forms a hydrographic system that penetrates 3,058 km into North America. The river proper, about 1,197 km long, issues from Lake Ontario, flows NE past Montréal and Québec City to the Gulf of St Lawrence, from about 44° N lat near Kingston to about 50° N lat near Sept-Iles. 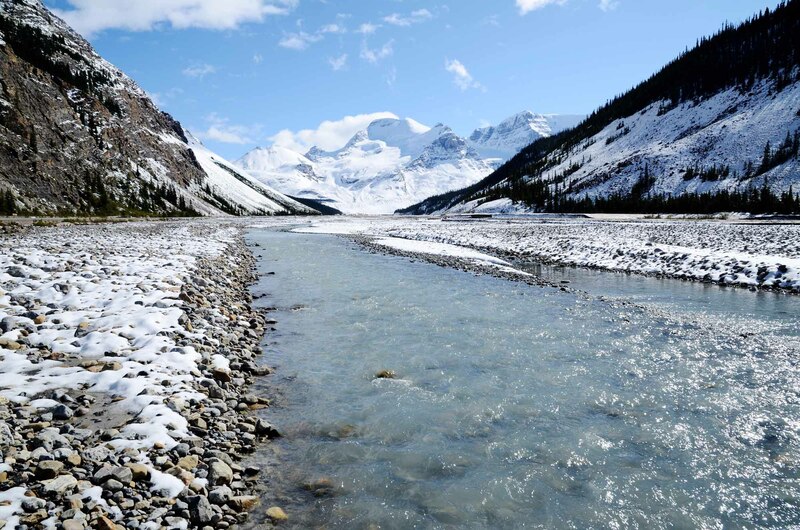 The river's drainage basin covers some 1 million km2, of which 505,000 km2 is in the US, and its mean discharge of almost 10,100 m3/s is the largest in Canada. Its greatest tributary, the Ottawa River, drains some 140,000 km2, the Saguenay River about 88,000 km2, the Manicouagan River about 45,000 km2, the St-Maurice River some 43,300 km2 and the Richelieu River about 22,000 km2. In geological terms, the St Lawrence is a young river, whose bed is a deep gash in the Earth's crust exposed some 10,000 years ago as the glaciers receded. The route of the explorers and main axis of New France, the river figured prominently in Canada's early history, and it remains the focus of settlement for much of the province of Québec. 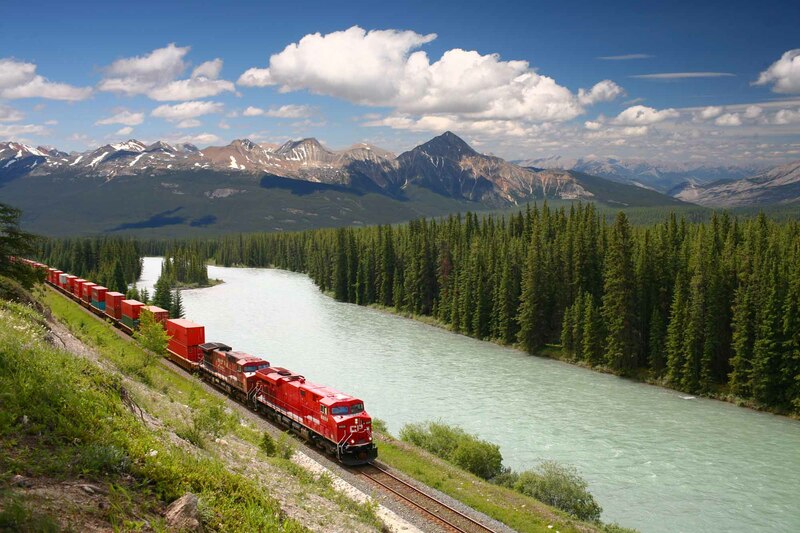 It is still the most important commercial waterway in Canada, as well as a source of electric power and natural beauty. The St Lawrence forms much of the southwestern outline of the Canadian Shield, which encroaches the river at Québec City. At Cap-Tourmente, 40 km below Québec, the Laurentians rise 579 m above the river and follow its course past Les Eboulements (770 m), where they begin to retreat inland, to the Saguenay. 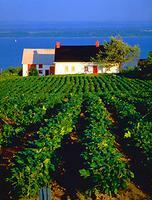 The S bank is generally lower, although the Appalachians approach the river at Matane and, continuing eastward, form the tableland of Gaspé. The westerly limit of the river itself has been set at Everett Point, Lake Ontario. The section from Kingston to Montréal is called the International Rapids, as sudden drops in the riverbed create a series of rapids (this portion was flooded in the 1960s, forming Lake St Lawrence). The river begins as an extended arm of Lake Ontario, choked with numerous islands, beginning with Wolfe Island and including the Thousand Islands near Gananoque, Ont. It trends NE past Brockville, Prescott and Morrisburg to Cornwall, where it broadens to form Lake St Francis. The Beauharnois Canal now carries shipping safely past the former rapids of Lachine and Les Cèdres to another widening of the river, Lac St-Louis, SW of Montréal. The Ottawa joins the mainstream through channels to Lac St-Louis and over a NE route via Lac des Deux Montagnes, Rivière des Mille-Iles and Rivière des Prairies. 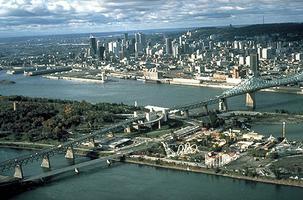 The land between the various channels at the confluence forms the archipelago on which the city of Montréal is built. The port of Montréal has been developed since the 19th century by dredging and canals. From Montréal to Trois-Rivières, the river is generally calm and unaffected by tides. A number of long, narrow islands continue to divide the mainstream and a large cluster, similar to the group at Lake Ontario, lies at the mouth of the Richelieu River at Sorel. The river broadens into Lac St-Pierre, some 15 km wide, and narrows again at Trois-Rivières, at the mouth of the St-Maurice River. From here to Québec, the freshwater flow becomes reversible with the tides. The river constricts at Québec where a promontory commands the entire upper course. The military value of the site was appreciated long before European settlement began. Past Québec the river divides to encircle Ile d'Orléans and steadily widens to 15 km at Cap-Tourmente, almost 25 km at Île-aux-Coudres. The water becomes brackish and tides are high. Near the mouth of the Saguenay River, the riverbed drops dramatically from 25 m to 350 m, forming a drowned valley in the lower estuary. The freshwater flow mingles with cold arctic saltwater. 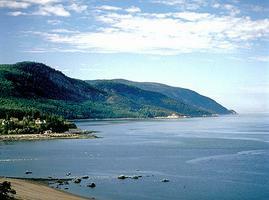 The town of Tadoussac sits on a terrace of sand and clay at the confluence, but the rugged Precambrian N shore is sparsely settled. The S shore of the estuary, which forms a great curve towards Gaspé, is more open towards its hinterland, and major roads, including the Trans-Canada Highway, head inland from Rivière-du-Loup, Trois-Pistoles, Rimouski and Matane. At Pointe-des-Monts, about 70 km E of Baie-Comeau and the mouth of the Manicouagan River, the N shore turns dramatically NNE for about 100 km to Sept-Îles, near the mouth of the Moisie River. The river doubles in width to over 100 km, forming a deep, broad submarine valley, in which strong currents pour in from the gulf along the N shore and sweep counterclockwise back to the E. The saline water of the estuary discourages ice, and the port of Sept-Iles is open year-round, despite its northerly location. According to the Royal Proclamation of 1763, a line from the mouth of Rivière St-Jean on the north shore past the western tip of Île d'Anticosti to Cap des Rosiers on Gaspé marks the end of the river and the beginning of the gulf. Over the course of the river, the vegetation varies from deciduous, mixed and coniferous forest to taiga. There are sandbank grasses in the freshwater course, and seaweed and other saltwater plants in the middle and maritime estuary. Fish include smelt, sturgeon and herring. Beluga whales inhabit the lower course, on which walrus was once also abundant. Massive flocks of migratory birds use the sandbanks or river reefs as seasonal stops, including most of the world's greater snow geese, which nest on the tidal marshes at Cap-Tourmente. Sedentary Indian groups - likely Iroquoian - were settled at the present sites of Québec [ Stadacona ] and Montréal [ Hochelaga ] at the time of Jacques Cartier's first explorations in the area in 1535. They had inexplicably disappeared by the time Champlain founded Québec in 1608, possibly dispersed by the nomadic Montagnais, Etchemin and Algonquin, with whom the French established a lucrative trading alliance. Jacques Cartier had discovered the river in 1535, with the help of Indian guides who took him past Anticosti, which he had believed was a peninsula. He built two transient camps near Stadacona in 1535 and 1541, but it was not until 1608 that the French foothold was secure. The St Lawrence River provides almost the only riverine entrance to the heart of the continent, and French explorers and traders used it to establish a colonial empire that stretched beyond Lake Superior. By 1760 most of the riverbank from Québec to Montréal was patterned with the long, narrow strips of the Seigneurial System, with the seigneury of Beaupré marking the eastern limit of settlement. The river system was suited to the carriage of buoyant softwood logs, and in the 19th century the river became the main artery of the timber trade. Montréal and Québec City grew into major commercial centres, as wheat and flour from Upper Canada were carried down the river. Under the leadership of the North West Co, the fur traders pushed the "Empire of the St Lawrence" all the way to the basin of the Mackenzie River. Donald Creighton and others have argued that the E-W axis of the St Lawrence, which provided a counterpoise to the N-S affinity offered by much of the continent's geography, helped make possible the future nation of Canada. 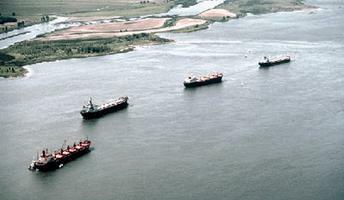 Today, with the development of the St Lawrence Seaway, the river links a vast area of Canada and the US with the rest of the world. It is still, as Cartier called it, "the great river of Canada." See also St Lawrence Lowland. The St. Lawrence River and Climate WarmingAn online feature about the impact of climate change on St Lawrence River region. From Environment Canada. 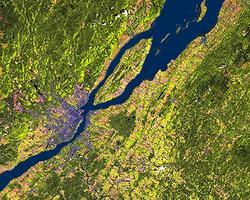 Save the RiverBasic facts and key concerns about the St. Lawrence River ecosystem. Lake Ontario and the St. Lawrence RiverBrief overview of environmental issues concerning Lake Ontario and the St. Lawrence River. From the Government of Ontario.